RICHMOND, California, Apr 23 2012 (IPS) - This year, Earth Day in Richmond, California was more than planting organic gardens or exploring solar panels. Occupy Richmond and a coalition of progressive allies turned Apr. 20 into Occupy Earth Day, and took aim at Chevron, one of the world’s wealthiest corporations. The corporate giant that turned a 27-billion- dollar profit last year, operates a refinery in Richmond and, according to Occupy Earth Day organisers, is the city’s largest polluter. “Earth Day is a day of the land where we live, a day of the people, of us who live and play and work on this land we call earth,” Richmond activist Jose Rivera told the crowd gathered at the Richmond subway station, before a march to city hall. The 100-year-old refinery sits on 2,900 acres of land, which is about 13 percent of Richmond. It processes 240,000 barrels of crude oil per day to manufacture petroleum products, and employs 2,900 people; six percent of them live in Richmond. 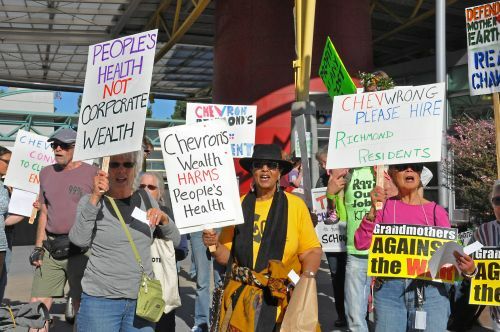 Richmond residents are not alone in their attempts to stand up to Chevron. In January, Nigerian women protested against Chevron with war songs and placards reading "No hospital facilities" and "No fish in the river." They said Chevron responded inadequately to a recent fire and that oil spills have hurt local farmers. In March, Romanians protested Chevron's move to explore for shale gas by hydraulic fracturing, or "fracking" which uses a mixture of water, sand and chemicals to open fissures in shale rocks to release gas and oil. Chevron reportedly suspended its exploration activities after the protest. Last year in Ecuador, damage to the northern jungles due to oil drilling resulted in an 18-billion- dollar judgment against Chevron. In Brazil, Chevron is facing a multimillion dollar lawsuit from damages caused by an oil leak off the coast. Located in the San Francisco Bay Area, about two-thirds of Richmond’s 103,000 residents are Latinos and African Americans. The city faces greater than 15 percent unemployment and struggles with high crime, poverty and underfunded schools. U.S.: "Money Isn't Speech, Corporations Aren't People"
City politics, until a few years ago, was controlled by Chevron. In 2006, Gayle McLaughlin, a Green Party member who refused to accept corporate campaign donations, was elected mayor. In 2010, Chevron spent more than one million dollars to support two pro-Chevron city council candidates and a mayoral challenger, according to the blog, Richmond Confidential. One of the candidates Chevron supported won a council seat, the others were defeated. In part due to the 2008 Supreme Court ruling in Citizens United v. Federal Election Commission, Chevron was able to spend almost 10 million dollars in the 2009-2010 election season to influence state and local elections in California and an additional 3.8 million lobbying California state officials, according to Antonia Juhasz, writing in The True Cost of Chevron. The most recent community win was the defeat of Chevron’s claim that it had overpaid its 2007-2009 property taxes by about 79 million dollars, because the county had inflated the value of the refinery. Repaying that sum would have hurt the cash-strapped city and other public agencies that benefit from property taxes. An appeals board, however, determined that the property value was even greater than previously assessed. And so, instead of the city owing Chevron millions of dollars, Chevron owes Richmond around 27 million dollars. Speakers at the rally strongly condemned the refinery’s role in polluting the city and linked its emission of greenhouse gases to Richmond’s high rates of asthma, heart disease and cancer. In 2009 and 2010 the California Air Resources Board ranked the Richmond oil refinery as the state’s largest greenhouse gas emitter. Richmond is facing the possibility of even more pollution, according to Jessica Tovar with Communities for a Better Environment, an organisation that struggles against environmental racism. Notably, among residents living within a mile of the plant, 79 percent are people of colour, and 25 percent live below the national poverty level. Addressing the rally, Tovar explained that Chevron wants to construct new facilities on its property that would make it possible to process heavier crude oil. But processing heavier, dirtier crude oil puts the community more at risk. IPS attempted to contact Chevron but did not receive a response before deadline. In a 2010 publication, “Chevron Richmond Today”, the company said it has invested in reducing emissions from the refinery and had been successful in decreasing flaring (the process of releasing pressure from the system) by 97 percent between 2007 and 2008. The publication quoted Tim Burchfield, an environmental specialist with Chevron Products Company. “We again experienced emission reductions in 2009, when we had the lowest emissions of sulfur dioxide and vent gas flared by any Bay Area refinery,” Burchfield said. At city hall, marchers, who had been accompanied through Richmond streets by a pink-clad brass band, were welcomed with street theatre, more speeches and music. Food was provided by Occupy Oakland – Oakland is about 19 kilometers from Richmond. In contrast to Occupy Oakland events, where activists frequently clash with police and city officials – and where the Occupy movement bars city officials from speaking at events – Mayor McLaughlin helped with the Occupy Earth Day logistics, making sure city hall bathrooms were available for protesters after normal business hours. A handful of Richmond police followed the march and observed the activities from a distance. In her remarks to the gathering, McLaughlin gave kudos to the Occupy Movement. “Last fall, when the Occupy Movement really made itself known, we in Richmond embraced it because we have been working in this progressive movement for so long.